Do your employees love their jobs? Better yet, what makes them love their jobs? These days, it’s not enough to simply work – and go to your job – to earn a paycheck. Most employees want to enjoy what they’re doing and the people they work with on a daily basis. Employee happiness, as we’d call it, matters. For example, the UK ranked 10th in the world for workplace happiness, while Miami, Los Angeles and Raleigh topped the list of U.S. cities where employees are happiest. But what gets employees to feel all warm and tingly about the work they do and the company they work for varies for each person. It’s not one single thing, to be honest. As our “Bridging the Internal Communications Gap” research study found, finding a healthy balance between personal and work lives is one of the most important factors in achieving employee happiness. Here are three of the most eye-opening findings and trends based on our survey of over 1,000 frontline employees across a variety of business categories, including retail, hospitality and entertainment, in the United States, United Kingdom, Netherlands, Spain and Germany. There’s been a lot of talk recently, and rightfully so, about employees having the legal right to disconnect outside of working hours. Personally, I completely agree with this. 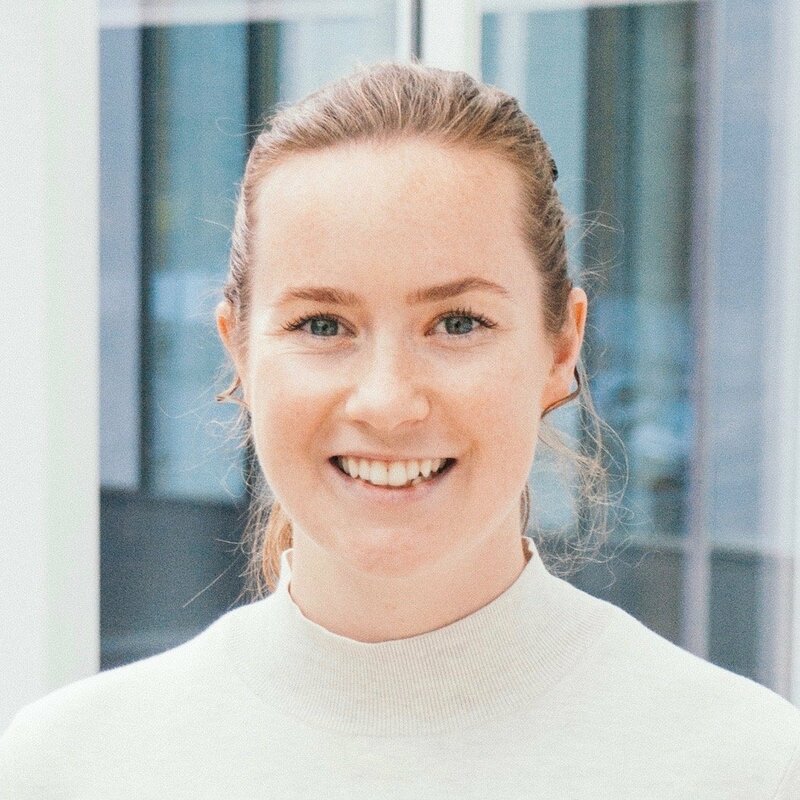 And here at Speakap, as a company whose entire business model and technology is built around delivering instant, relevant and engaging internal communications to frontline workers, feel just as strongly about this right. That’s why we launched our Do Not Disturb feature earlier this month to give the power back to employees themselves to switch off (when they end their work shifts/days) so they can cut down on stress, anxiety and focus on the personal relationships and activities that make them happy. While we already know developing this feature was the right move for our business, our clients and their frontline workers, the data from our research study reinforces this too. When we asked the respondents to clarify the most important aspect of how their company connects with them, 24 percent said finding a good balance between their personal and work lives is most important. As I read through the research study, I found one of the study’s findings quite surprising. It seems like every news outlet is talking about the innovation made possibly by AI, particularly in the workplace. For example, a recent Forbes article said that “AI’s real value is in enhancing, supporting and amplifying human truth, human experience and, ultimately, human freedom.” So you’d think features like artificial intelligence and voice recognition would be considered must-haves by workers, right? Wrong. 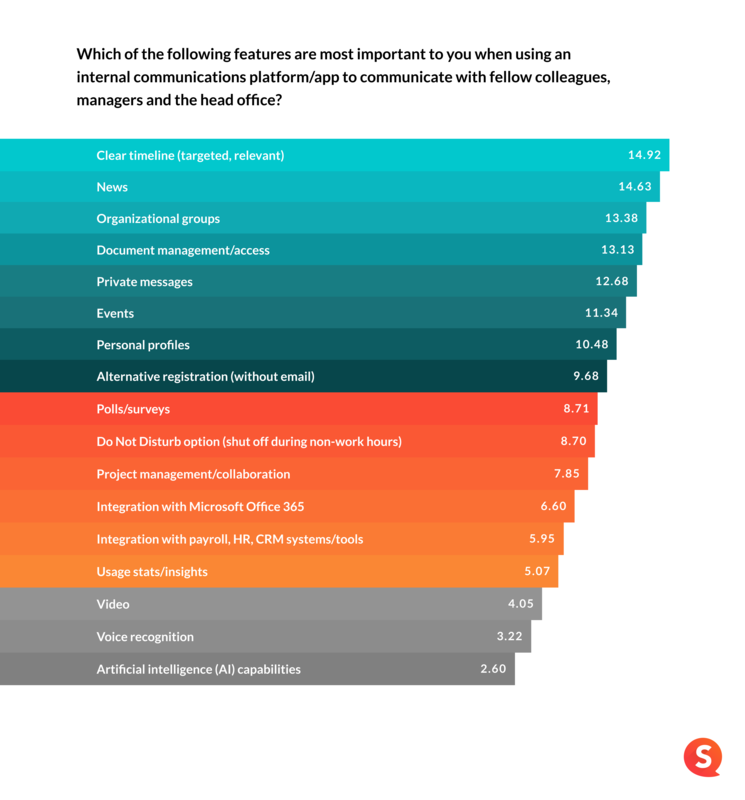 As our study found, features like artificial intelligence (weighted score of 2.60) and voice recognition (weighted score of 3.22) ranked lowest on the list of desired features of internal communications platforms. 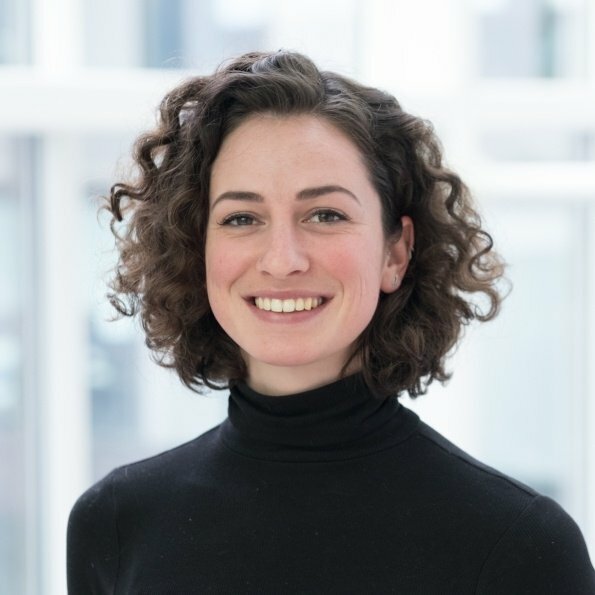 Conversely, our study found that the most desired features on an internal communications platform are ranked, in order of importance, as clear timeline (weighted score of 14.92), news (weighted score of 14.63), organizational groups (weighted score of 13.38) and document management/access (weighted score of 13.13). 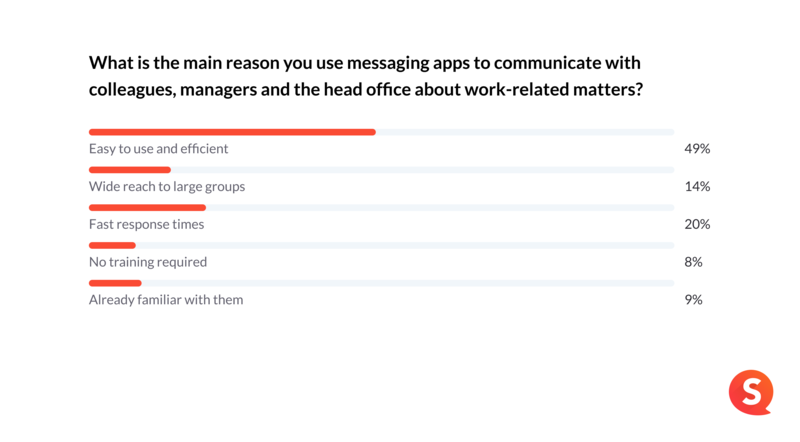 When we asked respondents to specify the main reason for their heavy reliance on messaging apps for work-related matters, almost half (49 percent) of the respondents cited ease of use and efficiency. Meanwhile, 20 percent cited fast response times and 14 percent said wide reach to large groups was their reason. While respondents in our research study described “wide reach to large groups” as a benefit of messaging apps, we would argue that it’s actually a disadvantage. Here’s why. One of the most frustrating things as an employee is getting too much information or having your newsfeed congested with information that’s irrelevant to your actual role, responsibilities and interests. Take, for example, an employee who works in the customer support department of a specific store in Manchester, UK for a global beauty retailer. 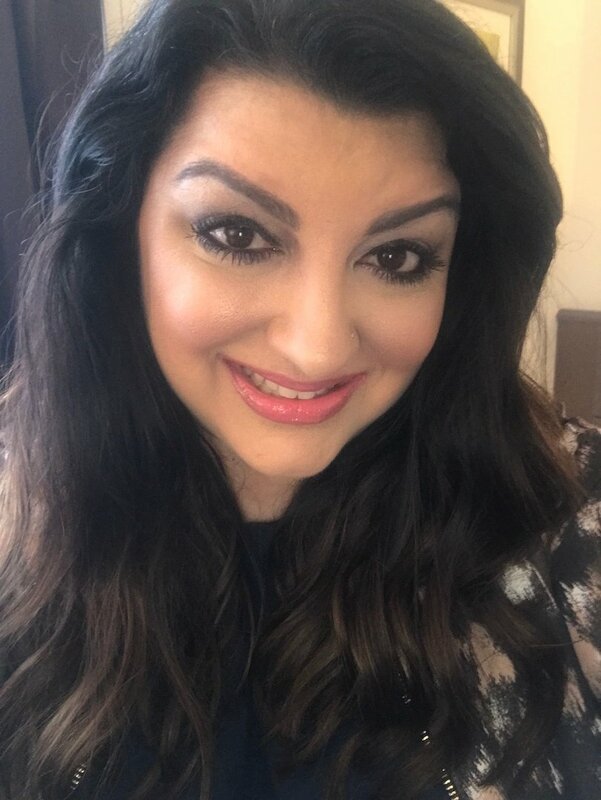 This employee doesn’t need to receive messages or have their newsfeed cluttered with updates related to the company’s multiple stores in greater London. The more this employee’s newsfeed – or messages – become cluttered by irrelevant posts and updates that have nothing to do with their role or the team/location they work in, the more frustrated the employee will become and the less likely they will be to open messages, respond to messages or check the newsfeed for key company news, updates and information. That means they could eventually miss out on receiving important communications about new products being launched or changes to promotional offers/sales. And the less they know, the worse the customer experience and the less sales they could eventually deliver. 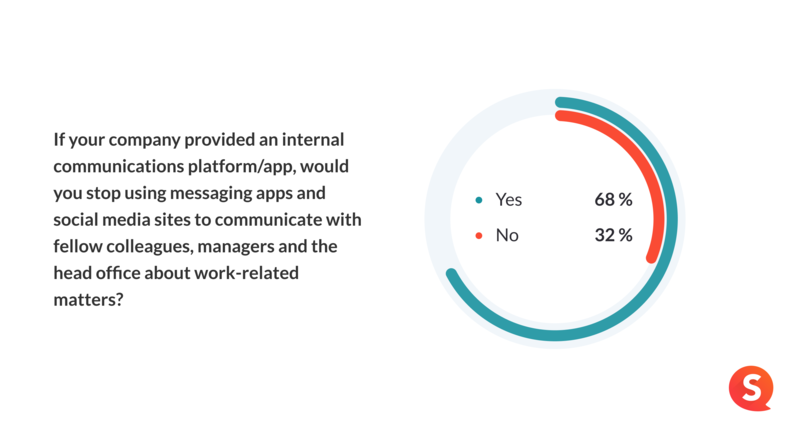 Now let’s talk about the data privacy risks that arise when frontline employees use messaging apps for work-related communications. In August 2018, cybersecurity firm Check Point Technologies said that it had discovered a flaw in WhatsApp that allows scammers to alter the content or change the identity of the sender of a previously delivered message. More specifically, scammers can change a quote – a feature that allows people within a chat to display a past message and reply to it – to give the impression that someone sent a message they didn’t actually send. To make matters worse, WhatsApp admitted that it was possible to manipulate the quote feature. Just imagine how serious of a problem this could be if a hacker manipulates an important message that was sent by the head office for a global beauty brand or fashion retailer – and that message was part of a group chat with over 250 people included. And just imagine what could happen if the altered quote gave the wrong information about a new product that was launching, or the price of that product. The store managers or retail associates could end up selling the product to loyal customers at the wrong (higher) price and if/when that error is discovered, it could result in customer frustration, less loyalty and lost sales (due to lack of trust). That is not the end result any brand wants.